New Shinedown music is on the way! Lead singer Brent Smith confirmed the band has begun working on material for its sixth studio album in an interview with WGRD in Grand Rapids. Smith told WGRD that the band actually has 22 compositions ready. Eric Bass, the band’s bass player, wrote them when they toured with Five Finger Death Punch in the fall of 2016. 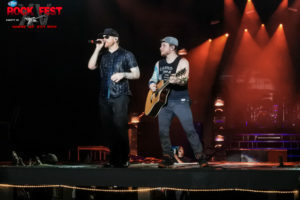 Shinedown will also stay busy this summer when they stop by Cadott, WI to play Rock Fest. The band was last in Cadott in 2015. This year they’ll join the festival with rock giants such as Avenged Sevenfold, Rob Zombie, Slayer, Korn, Volbeat, and Stone Sour. Tickets for Rock Fest are on sale now at www.rock-fest.com/tickets.